The Silvermills apartment is located in a small exclusive modern landscaped development ideally situated between the Georgian splendour of New Town, and the ‘village’ of Stockbridge, noted for its restaurants, cafes, bars, boutiques and shops. Only 15 minutes walk from Princes Street and the centre of Edinburgh it is an ideal location for a holiday or business trip to Edinburgh. This is a very attractive flat. The level of accommodation is very good indeed. It is very well situated for the popular Stockbridge area. The city centre is a short bus ride away or, even better, a 20 minute walk. Walking in another direction takes you to the beautiful Royal Botanic Garden. A real bonus for this flat is that it has a garage. Parking in Edinburgh can be difficult or expensive. The flat is in a great location close to Stockbridge and amazingly quiet. The kitchen was exceptionally well equipped with plenty of crockery/cutlery to be able to use the dishwasher. Garage was a real bonus (for a small car). Good to see guests are encouraged to recycle rubbish with clear instructions. would stay again - the apartment has everything you could think of and things even that you havent! in a safe secure, quiet location not far from the main streets of the city centre - we fully enjoyed our stay. Fantastic flat with everything you need. Our stay was very comfortable. This flat has absolutely everything you could possibly need for a short or long stay. Instructions to all the amenities and the recycling policy were very clear. Beds were comfy, towels provided and there was even welcoming shortbread. The flat is fully equipped with wifi, tv, washing machine, oven etc. So grateful to have found a place with a lockable garage rather than on-street parking. Our only problem was the ensuite bathroom light that was not working, so my mom had to wait for sunrise before she could shower. She also battled with the stairs but that is not the flat's fault. I was very impressed and will definitely stay again if I am ever so lucky to be in Edinburgh again. It is a very nice, clean and well furnished flat. Furthermore it was centrally situated with convenient public facilities nearby. We were also grateful for the good service which included fulfilling our special requirements. This flat is highly recommendable. The one negative... Our stay was much too short! The appartement has everything you need and much more! With complementary biscuits, tea and coffee as well as milk we were able to have a quick breather before heading downtown. We can recommended this appartement within walk-in distance to restaurants and local shops as well as downtown Edinburgh (about 10-15 minutes slghtly uphill) we fully enjoyed our all to short stay! A very big THANK YOU! This is our seventh visit to Silvermills which is conveniently located close to the city centre with all attractions within walking distance. The flat is clean and comfortable and an added bonus is the secure private car parking. Always an enjoyable stay! Soacious and well equipped apartment in quiet location a short walk or bus ride from main tourist attractions. Welcome pack appreciated. 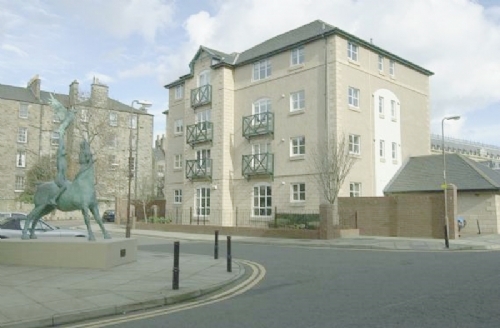 A spacious 3 bedroom flat that's located very near to the monuments and landmarks in Edinburgh. Provision of car parking facility is a great feature. The flat is well equipped for preparing food, with plenty of utensils, crockery, and kitchen appliances. The owner has a folder full of information on the logistics of checking in and checking out, as well as details for sightseeing recommendations. A pleasant place to stay in Edinburgh, bus stops close by. Fofget the car, parking is IMPOSSIBLE. A very, very well equipped apartment in a quiet location, a 15 walk (up hill) to the lovely city centre. The location is very nice and quiet, fully equipped, quality high standard in all rooms,complete kitchen, very good mattresses and curtains that keep all daylight out, kitchen table as well dining table, feeling at home. More than enough room for all of us (family with two teenagers), large bedrooms and nice bathrooms. Due to a lash in my leg, the walk into the city took much effort. Glad that the bus is only a few minutes walk from the apartment. Lovely comfortable apartment in great location on the edge of Stockbridge and only 10-15 minutes walk from Princes St. Great to have the use of the garage as our visit coincided with the Great Snowstorm of Spring 2018 but we had no need to dig out our car on the day of our departure. Great base for a visit to Edinburgh. This is a great, strategically located apartment in the village of Stockbridge which is a walking distance to central Edinburgh. We found the apartment tidy, well accessorised,with clean linen, supplies in the fridge and good tourist and local information booklets. Simply put, its home from home! We had the use of a garage as part of the package and we found it convenient to park our car and tour Edinburgh using public transport. The landlady,Margaret,was very helpful and approachable in providing details about the place. It was a great, relaxing,short holiday experience for us. We will come again. Having stayed at Silvermills previously, we knew the challenge that Dundas Street provides. We came away significantly fitter having walked to all the Fringe venues that we had shows booked for. The apartment is extremely well equipped and close to local shops. It is comfortable and a great base to use for visiting Edinburgh. Great location. 3 bedroom apartment was a home away from home. Very clean and comfortable. A perfect stay for our family. Wish we could have stayed longer. Plenty of room to spread. Really great and very relaxing stay. Thank you Lawson Lets. Silvermills Apartments is a very good place to stay at in Edinburgh. We were four adults. Had plenty of room for two couples. The rooms were nicely furnished, very clean. The kitchen was equipped with everything we needed even for cooking. The location is ideal. Very quiet. We did not even hear the neighbours. Downtown is not far to get to. We always walked to Princess street. Since we were hiking in the Highlands before that was no problem to us. But there is also a Bus running nearby the Apartments going downtown. There are shopping facilities in the area and my sister-in-law even found a hairdresser around the corner. We had rented an apartment at Silvermills before. A few years ago. And we know we will be back as we like Scotland in general. We are Germans.and we will definitely try to rent at Silvermills again. Fantastic apartment & location. Highly recommend. Easy instructions to find it and get access. We loved our stay at Silvermills. The apartment was very clean, spacious & well stocked. The location was fantastic - we walked to all the sights in Edinburgh and loved wandering around in the local area of Stockbridge. Would definitely stay there again and recommend to others. We had a party of 5: 2 adults & 3 kids and it was perfect. This property provides a comfortable location within 10 mins walk of Princes Street and Waverley Station, but in an area which is clean and quiet meaning you get an excellent night's sleep. Everything you need is provided and the flat is generous in the size of the main living room and two of the three bedrooms, with the third bedroom and kitchen being adequate and what you would expect for a flat of this type and age. I can't overstate the convenience of the location. There is both a Tesco express and a Sainsbury's local 5 mins from the door, and Stockbridge itself has many interesting independent shops to explore. The area includes parks and beautiful architecture for evening walks when it is hard to imagine the hustle of the city centre is so close by. While this flat obviously has a high occupancy, it is perfect to relax in without worrying about preserving high end finishes and pristine surroundings - a real home from home and we loved it! We spent a week at Silvermills and found it to be a great location for getting about on foot. It was an easy walk to Stockbridge shops and cafes. The Stockbridge sunday market was great to look round and see a variety of street food on offer. The flat is well equipped and roomy. A great flat with lots if space in a great location. Took about 15 minutes to wlak and was easy to find. Plenty of room inside, a lot bigger than it looks. Definitely think you would struggle to find anything like it for the price we paid over the weekend. The apartment is spacious and really well equipped, as well as being on the doorstep of Stockbridge where we wanted to be. We felt right at home the minute we opened the door. Every room was comfortable and clean. The owner was very easy to communicate with, and a locked garage was a huge bonus-we left the car in it and walked everywhere. We didn't want to leave at the end of the week. We were so happy with the apartment. Very quiet area, you wouldn't think you were in the city centre. Great location to do visits anywhere and good transport links close by. Apartment was so clean and comfortable and had everything we needed at hand. We would definitely use again and recommend. It was my first time in Edinburgh with my wife and children. The apartment was very good, clean and complete. Definitely worth and value for money. I would definitely recommend them to others and if I ever come to edinburgh again, silvermils apartment is my first choice. Went for rugby international weekend. Apartment was easy to find in a good location. Antiquary pub 5 mins walk from apartment very much worth a visit. Food was good and reasonably priced. Would definitely recommend Silvermills for a stay and would stay there again. Perfect as always, super apartment quite central for christmas shopping!everything you need inside and its clean and tidy. Flat was lovely, homely, 3 bedrooms, 2 bathrooms, well-equipped kitchen and big lounge. Flat was clean and large enough that our group of 5 never felt cramped. Location was great, just north of the city centre in a quiet neigbourhood with local conveniences nearby (supermarket, cafés, lunchrooms): ideal to grab some rest during your busy itinerary in Edinburgh. Would recommend! Comfortable, well-equipped flat in great location. Lots of restaurants and cafes nearby and a short walk into the centre of Edinburgh. Having car parking space was a bonus. Comfortable flat in a superb area of Edinburgh. The owner was very helpful when a small problem arose. Stockbridge, with its eclectic array of shops and restaurants, is close by. Comfort and convenience in Stockbridge. This was our fourth visit to the Silvermills flat in Stockbridge which is on the periphery of Edinburgh city centre. The flat is very clean, comfortable, and well-equipped. The area is well served by shops,restaurants and pubs of excellent standard and has good public transport links. An added bonus is the flat's own garage. We shall definitely be back next year. Great location and flat for an Edinburgh break! Really clean and comfortable with easy access to various attractions in Edinburgh. Great place to relax after a busy day in the burgh. This property was rather hard to find, both as a pedestrian and driving a car. Nevertheless, it was fully equipped and comfortable. It was lovely to find milk, oj and shortbread biscuits for a reviving cuppa. The notes I received stated that the owner would ring to make sure all was ok. This didn't happen, but there were no issues. This is my 3rd stay at this apartment and once again it was clean tidy and newly decorated, 10 minute walk from the city centre , good bus routes nearby. will be back again! Very practical and confortable appartment, very centraly located (only about 15 min walk from Princes Street) but at the same time situated in a very quiet neighbourhood. Perfect! Perfectly happy, very quiet day and night. Very handy having our own locked garage. Good location for our venue at the Botanical Gardens. We even had some sunshine. I NEVER recommend to others. It is for use an excellent location to stay with a family. With 3 bedrooms and a spacious living room it is a ideal place to stay with 5 people. The city center attractions are not far away, small supermarkets and pubs are close by. The location is in a dead end road, therefor you hear not any traffic noise. The apartment provided a very comfortable and well equipped focus point for a family gathering before Christmas. This is our fourth stay at the property and as usual everything was in excellent order. Have recommended it to several other friends and will also look to come back in the future. Great apartment in a good, quiet location. My family and I (5 of us) had a really enjoyable stay at Silvermills. Will definitely recommend and use again when in Edinburgh. Thanks to Margaret for all the help she gave us with our stay. We stayed to enjoy the Fringe and had an excellent time. The apartment is clean, comfortable and very well equipped. Local shops within walking distance were very useful. We would definitely recommend the apartment and look forward to being able to stay again in the future. Wonderful appartement, near the city, clean , quite and a nice livingroom. Wonderfuul appartement. Near the City, clean, quite, tipical english. Good Place to stay. Big Roms. Good quitchen. Nice to be there again. There was washing machine. Good location. Very comfy and plenty of room. Felt like a home away from home. Well equipped kitchen with all mod cons. Lovely area and only a short walking distance to the Royal Mile. The flat was clean and comfortable. It was light and spacious with everything we needed for our short stay.The location was excellent as it was in a quiet residential area but within easy walking distance of the city centre. We would definitely consider booking the same flat if we return to Edinburgh. The spacious apartment perfectly fit the needs of 4 adults and 2 late teens, providing kitchen, washing machine, large living room. The gps directions baffled us briefly, garage parking was nice, very safe neighborhood. Convenient walking to old and new town, although both were uphill. Had a lovely stay in this apartment which was in a superb location and very central for where we needed to be for The Moonwalk Scotland. The apartment was well furnished and comfortable.Would definitely recommend and use this again. Lovely appartment with plenty of room in a great location. Very quiet area. Confortably sleeps 5. Clean and well equipped. May benefit from a slightly better mattress in main bedroom as a bit springy but can't fault it otherwise. Thank you. Excellent location, excellent communication from the owners and an excellent price. The apartment is spacious and clean with everything you could possibly need. We were even supplied with coffee, tea, milk and orange juice. I would definitely recommend Silvermills. This was our 5th visit to silvermills during Hogmanay week. The flat is superb for families & is equipped with everything you need. The location is fantastic, we walked into Edinburgh City centre every day & only used out car once during our stay. A really comfortable apartment, fully equipped and comfortable. Plenty of space for our family to relax. Great location, close enough to city centre without being too busy and loud. Well situated in quiet news & well appointed. 10 minutes walk away from main tourist areas & Beanhunter coffee with lots of local speciality shop, bars & cafés nearby. Secure garage parking an added bonus although we didn't need to use our car during our stay. Our only criticism, and it is a small one, would be that some furnishings give the impression tiredness. The photographs of this apartment really don't do it justice. It was like a home from home a very spacious modern apartment only a 15/20 minute walk from Princes Street. We asked the owners of the property several questions before our arrival and they always replied promptly. Next time we are in Edinburgh we will definitely look to see if this property is available a very pleasant stay was had by all !!! A very clean and tidy property and excellent value for money. Lovely apartment in great location. very quiet area 15 minutes walk from Princes Street, and a useful garage in block (big enough for a Mondeo estate car). Extremely well equipped, but looking a little dated and tired. Clean and comfy with everything we needed. It was easy to access by car and really close to the city centre, which meant we could walk instead of using the bus. The flat had everything you could possibly need and was home from home. There were five of us, one couple, two males and a single female so it worked out cheaper than booking into a hotel. Having two bathrooms made things easier. We didn't need to use the heating as we found the flat lovely and warm. We visited in October. The apartment was beautiful it was home from home and we would love to use again. there was everything we needed and more. I would definitely recommend. Walked into Edinburgh every day while my husband and son went to golf . great location and large apartment so plently of room for the 4 of us. Had every thing we needed also having a large lounge allowed us to relax aftyer sight seeing. Coffee grounds were left in the coffee pot and had become mouldy . There was a smell coming from the refrigerator. Once that was taken care of we enjoyed our stay very much. A very comfortable apt. The apartment had every home comfort. Plenty of bedding, towels and kitchen equipment. Quiet location near local shops and restaurants but only 10 minutes walk from the centre. A large flat set in a good location. 5 adults stayed for 2 nights and it was plenty big enough for us. Well stocked kitchen and a Large dining table. Slightly dated decor but very clean. Would definitely stay again. This was our base for discovering Edinburgh and for going to Glasgow for the Commonwealth Games. The location was within a 15 minute walk of Princes Street and 20 minutes from the Waverley Station. The apartment itself is excellent; clean, tidy and well equipped, we were sorry to leave. There was plenty of room for the five of us. A very comfortable, well equipped apartment in a great location with the advantage of secure garaging. One I would recommend to others and return to when in Edinburgh again. We had a great weekend at Silvermills. The apartment is excellent and very comfortable for the five of us staying there. We were able to have another 4 family members for a meal on one of the evenings we stayed there. It was well located for Central Edinburgh and such a bonus being able to walk to where we had to go. Our stay was the first visit to Edinburgh (three friends traveling), and we were astonished at how beautifully-kept and equipped this flat was. It felt like we were truly staying at a home, not a hotel. Having the basics of tea, coffee and milk provided really took some of the stress out of our day. We all had a wonderful time and wouldn't hesitate to recommend the property to others traveling to Edinburgh. Great location as it was so central. If you drive here, you can just forget about the car for the duration of the stay. The accommodation was well prepared and had everything that you might need for the holiday. Good central location with car parking which was a bonus. Flat was a good size and was equipped for all holiday requirements. Only downside was having to leave after holiday was over. A comfortable & spacious apartment with ideal location within easy walking distance of the city centre. Plentiful supply of kitchen equipment, cleaning products, bedding & towels. This was our 4th stay & although the cleanliness was much improved from last year there was still room for a little improvement. Overall, good value for a holiday in the fantastic city of Edinburgh. Cant get over how awesome this place is! Really loved this apartment, after a really bad expierence in Barcelona this apt was a palace. very warm cosy, brillant location. Excellent price. apartment was very secure and had everything one needed for a pleasant stay. close to all the shops and just a few minutes walk to the royal. 6 of us stayed here and not one complaint.